See the Hudson Like You Never Have Before! 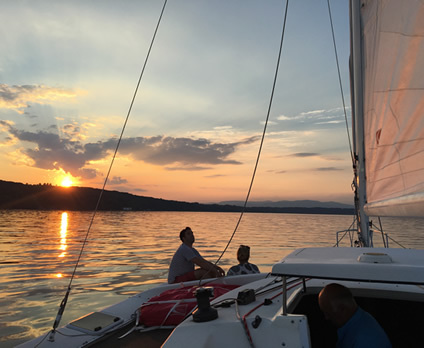 Hudson Sailing invites you to join us for a sunset sail or a daytime sailing charter aboard Cirrus, our fast, fun racing trimaran. You will experience multihull sailing at its finest while you enjoy the best of New York sightseeing and Hudson River sailing charters available. Adventure boating excursions aboard Cirrus take you on the fastest, safest and most comfortable sailing trip you can imagine. Enjoy our popular 3 hour sail: morning, afternoon or evening. Referred to as a “rejuvenating mini vacation,” this trip is great for all ages. Cool off in the clean and refreshing waters of Norrie Cove while we grill up lunch! Learning to sail is fun! With your U.S. Sailing certified instructor learn beginning to advanced multihull sailing. We provide delicious beverages and farm to galley hors d’oeuvres that are organic home grown, or wild crafted foraged delicacies prepared by our chef/captain/owner, Dan Feldman. Your Captain and Crew are the most experienced sailors in the area with over 200,000 nautical miles sailed and a combined 80 years experience with sailing trips on almost every ocean and sea on the planet. Sailing is Green! Hudson Sailing is Greener!! We are all about a sustainable future. 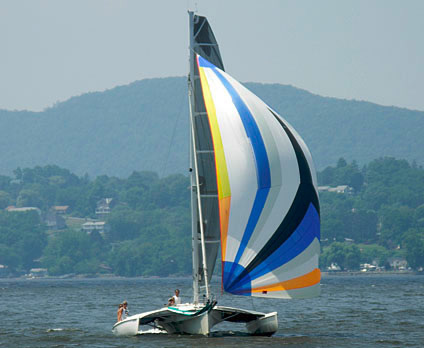 Cirrus is the most efficient sailboat on the Hudson River. We are almost 100% solar powered and consume a minimum of fossil fuel because when others have to motor, we sail with the slightest breeze! The Hudson River Valley offers spectacular views, abundant wildlife and clean, fresh air. 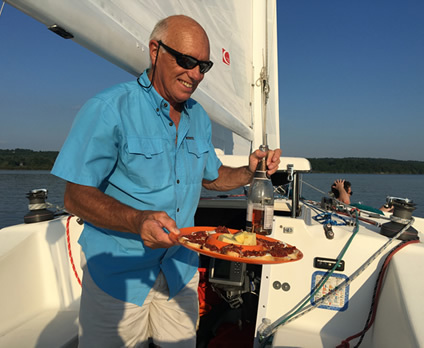 Whether you are from New York City and beyond or Kingston, Rhinebeck, Rhinecliff, Woodstock, Saugerties or Tivoli sailing with us is the experience of a lifetime. Fall colors, spring flowers and summer sunsets, see it all with Hudson Sailing!